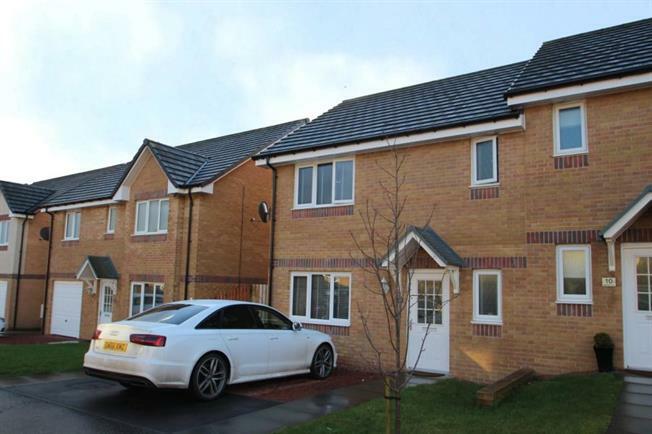 3 Bedroom Semi Detached For Sale in Bishopton for Offers Over £190,000. An impressive modern semi detached villa with a stunning interior. This outstanding property benefits from a great garage conversion currently utilised as family room or option as a fourth bedroom or dining room . Furthermore the accommodation on the entrance level comprises of a beautiful lounge leading into a modern fitted kitchen with an extensive range of high end integrated appliances and a conveniently located WC in the welcoming reception hallway. There is access out into the enclosed rear garden via French doors leading from the kitchen. On the upper level there are three spacious bedrooms with master incorporating stunning en suite shower. The accommodation is completed by an immaculate family bathroom. The specification of the property extends to gas central heating and double glazing. To the front of this wonderful family home is a driveway for two vehicles and the landscaped rear garden comprises of lawn, patio, and decking sections. Early viewing is recommended in order to fully appreciate this excellent family home. The property is well placed for a wide range of local amenities including nearby Braehead which provides a wide selection of shops, restaurants and a cinema. Local transport links including Bishopton Train Station provide quick and easy access to the surrounding areas including Braehead, Silverburn and Glasgow City Centre. Glasgow Airport can also be found a short distance away.